For over 40 years I have cooked a turkey for our growing family. I used to wrestle that carcass into a paper bag and roast him. Then I got smart. It’s a lot easier to put the bird in a roasting pan, cover it tightly with foil, and bake it in a very hot oven at 450 degrees. Here are prescribed times depending on the size of your chilled turkey. Add 30 to 45 minutes to the total cooking time if you stuff the bird. 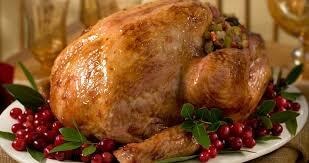 When turkey has cooked to within 15 to 20 minutes of total cooking time, remove from oven. Uncover to brown for 10-15 minutes.